Oturnio holds the blue light of Krishna. This heavenly frequency supports you in finding the right way when travelling in the time-space continuum. It brings clarity and lightness to the spirit when travelling in different realms. Oturnio strengthens contact with Krishna and through him it is possible to gain access to the magnetic field and the grid nets. Oturnio brings harmonisation and strengthening of the magnetic fields and it supports travelling through the dimension gates. It enables access to the new space-time continuum and brings orientation in the parallel worlds. 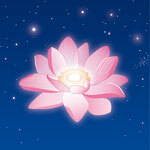 Apply one drop on your lotus chakra, both feet and on your heart chakra. Hold the essence in front of your heart, then lead it forward until your arm is stretched. Do the same to the right, to your back and to your left side. Hold the essence in front of your heart chakra and make a clockwise circle in front of your heart with the bottle. Apply one drop on your throat chakra. Hold the essence with about 3cm distance in front of your throat chakra, then lead the essence clockwise around your body on the level of the throat chakra. Hold the essence with about 35 cm distance in front of your throat chakra, then lead the essence clockwise around your body on the level of the throat chakra. Apply one drop on your brow chakra. Hold the essence with about 3cm distance in front of your brow chakra, then lead the essence clockwise around your body on the level of the brow chakra. Hold the essence with about 35 cm distance in front of your brow chakra, then lead the essence clockwise around your body on the level of the brow chakra. Apply one drop on thumb and index finger of both hands; put your right thumb and index finger on your tailbone, and your left thumb and index finger on your atlas (back of your head) until the energy of the essence has flooded your entire spine. Finally, take one drop of the essence under your tongue. Asking questions are actually nice thing if you are not understanding something entirely, except this piece of writing presents pleasant understanding yet. Just wish to say your article is as astonishing. The clarity in your post is simply great and i can assume you are an expert on this subject. Well with your permission let me to grab your RSS feed to keep up to date with forthcoming post. Thanks a million and please carry on the gratifying work. For latest news you have to go to see the web and on the web I found this web site as a best web site for most recent updates. I'm curious to find out what blog platform you happen to be utilizing? I'm experiencing some minor security issues with my latest site and I would like to find something more safe. Do you have any recommendations?